That is disgusting! Everyone knows that margarine is much better for you. Obviously not a school lunch, but I still figured you would be interested. Margarine isn't actually much better for you than Butter, they contain virtually the same ammount of fat - just different kinds of fat. But they are both pretty bad for you. Yes, butter and the margarine of the past use to have the same amount of fat where margarine contained trans fats. I believe these days some margarine has no trans fats and might be better for you than butter, but none has been able to duplicate the wonderful taste of butter! Everything in moderation, no? lol I was wondering if that was sarcasm.Gotta hate reduced sarcasm awareness online. Hmmm chocolate covered bacon....that looks like a tempting depression food....Who needs ice cream and cookie dough when you got chocolate covered bacon! 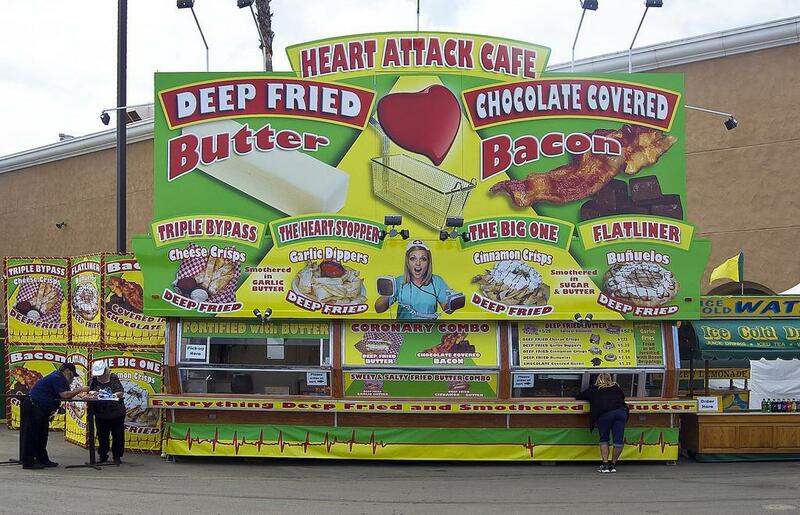 And how does one deep fry butter? Anon #4, the deep fried butter recipes I've seen consist of frozen chunks of butter that are battered and then deep fried. I've never had them before, but my sister said they're like donut holes with butter in the middle. I think I'd rather have deep fried ice cream. Again, there the ice cream is frozen super-hard so it can be breaded and then survive the deep frying process without melting. You end up with a scoop of ice cream with a crunchy outer coating. It was yummy but definitely not something you want to eat more than once in a while. yeah i agree. wouldnt it melt haha maybe they deep fry butter the same way they fry ice cream? Butter is better than margarine, margarine has hydrogentaed oils which are worse. Not too mention GMO ingredients as the base. At least your body has a fighting chance with butter. Real butter is not as bad as people think it is. deep fried anything is bad for your insulin levels cause of the hydrogentaed oil, butter is good raw. Tibetans have butter tea with a big rock salt every morning, they live pretty long lives. people in south of france eat lots of butter, and they live into the 90s. Its the source and how you prepare butter.